Toddler Activities in Richmond – Perk! 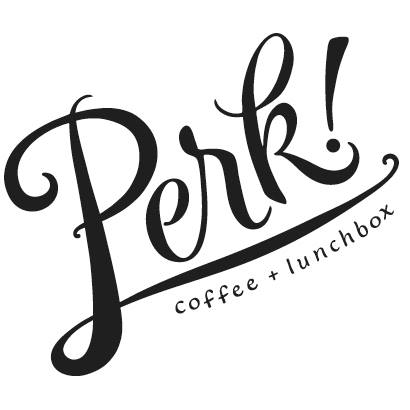 Perk is a locally owned coffee shop in Chesterfield that serves a wide assortment of house-made coffees, teas, pastries, and even “lunchboxes.” The cafe is very accommodating for young children and strives to create a welcoming environment for everyone! Homes For Sale Near Perk! Perk! is a hidden gem in Bon Air, especially if you’re looking for easy and fun toddler activities. It’s rare to find a place outside of the house where Moms can unwind with a bite to eat and just be in an adult setting while their toddler is safe and entertained. Walking in, it is hard not to notice how chic and aesthetically pleasing this place is. The customer is transported instantly to a downtown Richmond or Carytown cafe with its urban feel. The interior is both cute and practical. For instance, there is ample space for strollers and carriers, along with several high chairs provided, which is a detail often by some cafes. The staff is very helpful and friendly, including the owner who took the orders. 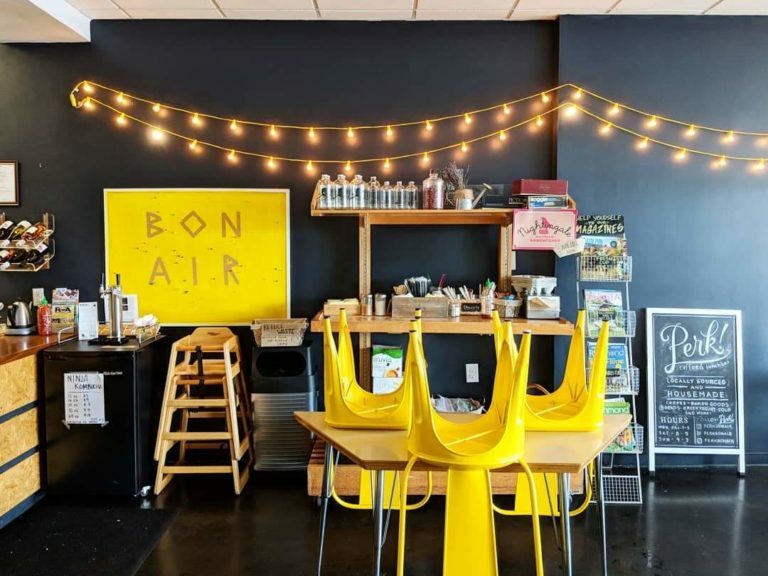 The owner, a Richmond local and mother herself, wanted to open a coffee shop that brought the artsy atmosphere of the city to the suburbs and most importantly, was kid friendly. With two little boys herself, she understands how chaotic bringing children to a coffee shop can be so she used this insight to create Perk, a coffee shop where everyone feels accommodated and accepted, especially parents with young children. She designed the coffee shop specifically for toddler activities, but also for the moms to enjoy. Along with its welcoming environment, they offer great food. 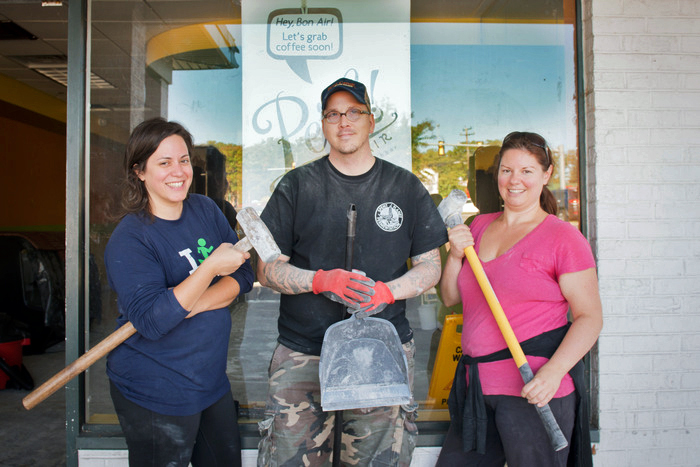 Their ingredients are locally sourced and all their yummy treats are homemade. With all of their menu items being made in house, excluding their gluten-free items, people have a better piece of mind about what they are feeding both themselves and their kids. Whether you’re just stopping in for a cup of coffee or a full lunch this café has it all! The menu had plenty of options to please everyone (including the picky eaters). 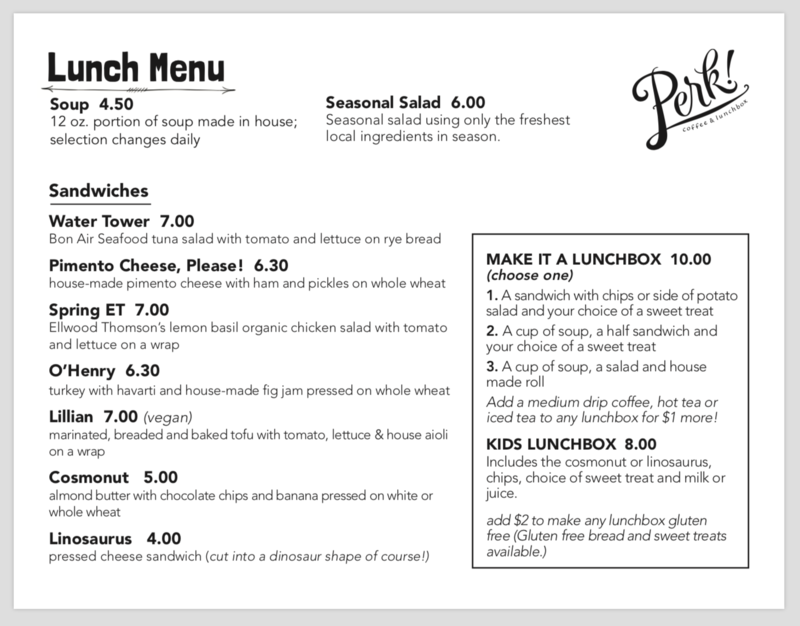 They also offer make your own “Lunchboxes” for both kids and adults. These boxes were even featured in Richmond Magazine’s Ultimate Lunch Guide! can have a conversation without being distracted or hovering. It’s all free too! They host events specifically for kids and of course, these toddler activities are free as well. 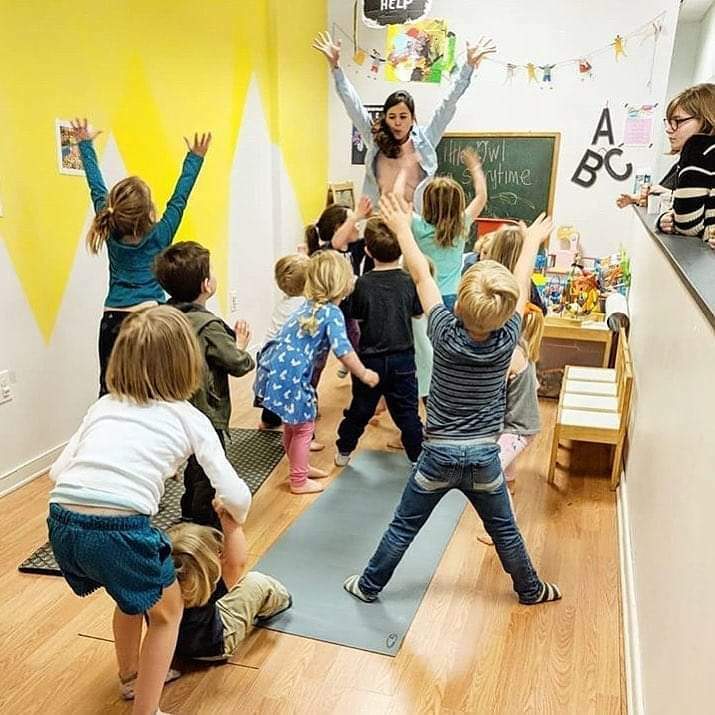 For example, they have yoga storytime and music class.